This game is really emphasizes the creativity of your budding "make up" artists. To prepare for this game, have a large variety of make-up, wigs, and old clothes available. Create a list of famous people. These people should have a fairly distinctive look. For example: Marilyn Monroe, Charlie Chaplin, Mickey Mouse. Write these famous names on individual index cards and place them in a bag. Each team will take turns pulling "Famous Faces" out of the bag. As a team they will work together to create a look that mimics the famous face. Without speaking, the team will attempt to enact their famous person for the other team to guess. The team with the most successful enactments wins. You'll like this one. Be sure to have your camera ready. To prepare for this game you'll need lipsticks, several small boxes with tops, and a few stones ("lead"). 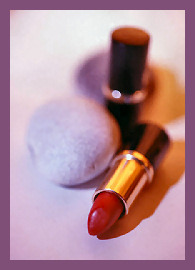 Place a tube of lipstick in one half of the boxes, and stones in the other. You'll need a box for every guest at the party. To begin the game have the children form a circle. Select some appropriate music: Prince's "You Got The Look", or Madonna's "Material Girl". When you start the music every guest will pass her box to the left, and so on and so on. The passing will continue until the music stops. When the music stops, the girls have to open the boxes in their hands. If lipstick is in the box, she has to apply it somewhere on her face (without a mirror). If a rock is in the box, she gets to apply lipstick on someone elses face. The rule is that lipstick cannot be applied in the same spot twice! Note: An alternative to this game would be to give each girl her own personal set of makeup: lipstick, eyeliner, mascara, blush, glitter eyeshadow. In each box place one of two different kinds of trinkets. One trinket will instruct the girl to put on an item of makeup. The other trinket will prevent her from putting on any more make up. The rule, again, is that you cannot apply makeup to the same spot twice. This is an ultra cool relay race. To prepare for this game you will need six 3-foot lengths of fairly hardy cloth rope. Tie 3 of the ropes together at one end. You should have two rope bundles when you are finished. Tie the bundles to the backs of two chairs so that their loose ends are hanging down. Divide into two teams. To be fair you want a show of hands of the girls who can braid and those who cannot. Divide the teams evenly by skill. Give a practice demonstration for the girls who have never braided before. Then line the girls up behind the chairs. On the count of three, the first person in line, braids her ropes to the end and then loosens them. The next person in line does the same, and so on. The first team to complete the braiding - both braiding and loosening - wins!. Cut out and laminate a large featureless face (hair is fine to include). Then create and laminate eyes, nose, mouth and ears. Apply scotchtape to the backs of the features so that they will stick when applied to the face. Each child will take a turn being blindfolded and trying to assemble a recognizable face. The only trick is that the child will be turn around and around between the application of each feature. The child that assembles the most recognizable face wins! This game will need a little research on your part. Go online and find out the beauty standards of several different cultures around the world. Describe the beauty standard on index cards without including the culture that it comes from. Place all the cards in a bag. Give each team a list of the cultures that the beauty standards are seen in. Each team takes turns drawing from the bag and reading aloud the beauty practice. The team the answers the most correctly wins.